Why Your Two Wheelers Require Protection: Your SCOOTIES need Protection from Harsh Weather and many more external factors Like, Heat, Rain, Rust, Bird Droppings etc. That is why a good Quality Body Cover is Must have accessories. When you search online for the Bike protective Cover, Chances is that you will get thousands of Products on Portal available at very cheap price and so the material is being used is of very cheap and poor quality. 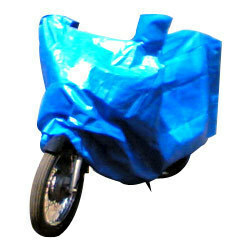 Mostly Parachute and Taffeta fabrics are used which is very thin and not provides the required protection to your Bike. So don’t lured from these Cheap offer instead go for good material which will cost you just few bucks more which is very nominal if you compare the Cost of your Bike. Material and Quality: Fight the Summer Heat, Winter Cold, Monsoon Rain and Rust. With Store Vila all season SCOOTIES, Body Cover. High Quality 220 GSM SUPREME TETRIPLY ETHILINE. Light and compact, folds easily : Its Designed to Provide all weather protection for Engine parts and body parts of Two wheeler. It is light and compact, folds easily. Stylish Design: Sporty, Stylish, Modern look with Mirror Pocket. Bottom strap to Tie : Sturdy Motorcycle cover comes with Bottom strap to Tie. An Universal Cover Can be used for both indoor and outdoor covering of Two wheelers automobile An indispensable and Must have Accessory for your beloved Bike at very Nominal Price. Care and Maintenance: Wash Bike Body Cover with mild detergent and water to keep it neat and clean. It is advisable to avoid the use of hard brushes and chemicals as they may cause damage to the natural fabric of the cover.